Officials appear to have used six examples taken from the Bible Gateway - a searchable online bible, and one of the world's most well-utilised Christian websites. The refusal letter also quotes parts of The Book of Leviticus from the old testament. Mr Stevens added on Twitter that his client will be appealing the decision and he will be complaining to the Home Office. Legal expert Conor James McKinney, deputy editor of website Free Movement, told Mail Online: 'Immigration lawyers often speak of a 'culture of disbelief' among the officials that make these life-or-death asylum decisions. Stephen Evans, chief executive of the National Secular Society told the Independentit was 'wholly inappropriate' for the Home Office to use 'theological justifications for refusing asylum applications'. 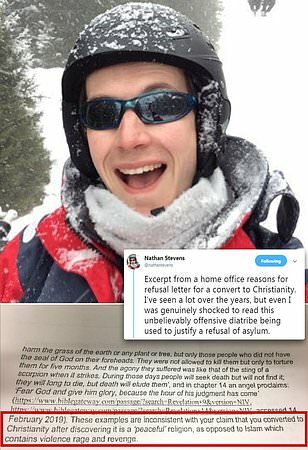 A Home Office spokesman said: 'This letter is not in accordance with our policy approach to claims based on religious persecution, including conversions to a particular faith.